After a fantastic 4 days in Kyoto, we caught the shinkansen (bullet train) to Tokyo, city of the future. 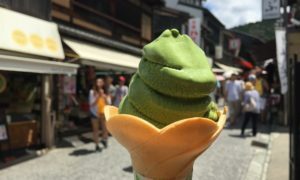 While in Kyoto we had soaked up (literally because we visited in August!) our visits to the breathtaking temples and shrines of the imperial city. In Tokyo we were looking forward to experiencing modern Japan with its neon lights and tech-forward ways. We had almost 5 days in Tokyo, which was a great amount of time to see all the different areas of the city. Tokyo attractions are spread out over a large area, but the very efficient metro system makes getting around simple. The colourful metro map can be a bit intimidating at first glance, but it is easy to get the hang of. The best thing to do is pick up a Pasmo card when you first get to Tokyo so you don’t have to bother buying tickets each time you take the metro (more on Tokyo Transport below). Here is how we spent 5 days in Tokyo and the highlights for us of Tokyo with kids. If you are visiting in winter, check out these top things to do in Japan in winter. 10.0.1 Enjoyed Reading this Post? SIGN UP for more. Tokyo is home to both Tokyo Disneyland and Disney Sea and you might scoff at the idea of spending a day at a Disney park while you are in Japan. BUT, there is just as much opportunity for cultural learning at a theme park as there is in a city and you don’t want to miss these really unique parks. We spent our first day in Tokyo at Disney Sea because we wanted to visit on Wednesday (a lesser busy day of the week). 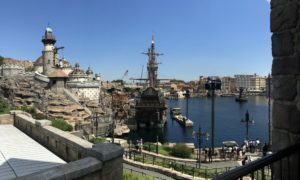 Read our full review and our 1 day itinerary of Disney Sea. It may not be experiencing traditional Japanese culture, but a trip to Tokyo Disney is a great way to spend a day. You have probably seen videos of this online or in the film “Lost in Translation” and it is definitely something you want to experience while in Tokyo. You emerge out of Shibuyu station to the all way Shibuyu crossing or scramble, which is apparently the busiest intersection in the world. Each light change can bring over a thousand people across the intersection. We did it a couple of times and while the neon lights at the intersection and masses of people are interesting, I did find it a bit over-rated. But still definitely worth doing. If you want to get a vantage from above, you can queue for a window seat at the 2nd level Starbucks on the corner. After Shibuyu crossing, we wandered up through Center-Gai, which is a pedestrian shopping street with restaurants and shops galore. More neon and more quintessential Japan. This is also the area where you want to eat kaiten sushi and spend an hour at a karaoke room (see below). Our daughter loves to sing and perform and we knew she would love the karaoke rooms that are everywhere in Japan. We just walked into the first one we saw on Center-gai and paid 300 Y/person for an hour (about $15 AUD). These rooms are so amazing…soundproof, with your own private karaoke machine that has English songs and instructions and they deliver food and drinks to your room! We started with 30 minutes, but quickly realized we needed longer to get through our playlist. This is such an amazing thing in Tokyo for kids and they will be so excited to take a break from the temples and sightseeing to bust out their singing skills. This is also a great rainy day activity or if you need to escape the summer humidity. Hot Tip – plan in advance what songs to sing so you don’t waste any time queuing up music. Most people have probably eaten at a conveyor belt (kaiten) sushi restaurant, or maybe even when the food comes around by boat on a canal. When we were in Prague we ate at Vytopna Restaurant where our beers were delivered straight to our table on a train track. It was the coolest thing ever. After being in Japan for 5 days we had eaten kaiten sushi and although the fish was much better and fresher then we have ever had, the experience was pretty similar. You had plates with different prices going around on the belt and you grabbed what you wanted. Clearly, this in itself is something kids love. Well Genki Sushi takes that to a whole different level. You sit at the sushi bar and you order what you want on ipads. In front of you is a couple of tracks where your food is delivered right to your table a few minutes after ordering. Best thing ever! Did the sushi taste good? Definitely, but we were so into the ordering process that we barely noticed! This is a popular place with tourists so you may have to queue for a table, but it is so worth it! I put this last because we saw Hachiko, the loyal dog because all the guidebooks and blogs recommend it, but really it isn’t that exciting. There is a nice story about the dog that became a legend as he waited at Shibuyu Station for his master each day. Once the master died, the dog kept coming to the Station for the next 10 years. It is a cute story and they have made a statue outside of the Station of Hachiko. Expect it to be crowded with tourists vying to get the perfect photo of the dog. Of course you should visit it because kids like a good story, but don’t set your expectations too high. Once you have seen and experienced the best of Shibuyu, take the metro a couple of stops to Harajuko. Harajuku is best known for its stately shrine, Meiji-jingu and interesting street fashion. Our 9 year old daughter was fascinated by kawaii culture (think lovable/cute/adorable everything) and although she is too young to remember Gwen Steffani’s “Harajuku Girls” she was eager to see some dressed up girls. We have 4 great things to do in Harajuku with kids for you to try. This is Tokyo’s grandest Shinto shrine and it set in a beautiful, massive green park. Although the shrine was destroyed in WW II air strikes and only re-built in 1958, it has an authentic, peaceful feel to it. Our kids were impressed with the massive torii gates, which are natural coloured and made from 1,500 year old cypress trees. It is a bit of a walk on a wide gravel pathway to the temple, but our kids loved the opportunity to run ahead. The decorative sake barrels you pass are a favourite of photographers. The temple was under renovation, so we didn’t spend too much time there. You could definitely spend more time at the beautiful Yoyongi-koen park, in which Meiji-jingu is set. Do you see anything wrong with this photo? Our kids love this trick! This shopping street is the centre of Japanese teen culture with lots of kawaii style shops and lots of kawaii foods like candy floss and crepe desert contraptions. It is a narrow and busy pedestrian street with lots to look at. We were really hoping to catch a glimpse of some “Harajuku girls” in elaborate, cute costumes, but we didn’t see anything too out there. This is a great place to reward the kids with a sweet treat. They sell these crepe desert things on every corner and we happily indulged. Omote-Sando is the high-end shopping street in Harajuku. It is a wide street with cars and features all the high end design shops like Gucci and Versace. If you are like us and not really into high fashion, it is still worth a wander to see the interesting architecture along the boulevard. I think one of the things our kids enjoyed most about Tokyo was all the interesting dining venues. Okonomiyaki are savoury Japanese pancakes that you cook at a grill on your table. This was another huge hit with the kids as they got to stir up our order, spread it out on the grill and decorate it with sauce afterwards. The pancakes are really quite good and come in a wide variety of flavours and combinations. You would definitely want to be careful with young kids as the grill is extremely hot. We ate at Sakura Tei, in a small street in Harajuku (use Google Maps to get there). You won’t find this place in most of the guidebooks, but it is such an amazing place to visit with kids. 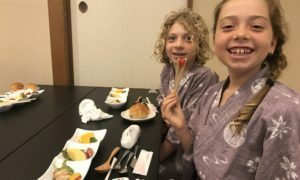 We heard about Fukagawa Edo Museum from Jason’s awesome Tokyo posts and it was one of our top things to do in Tokyo with kids. The Edo era (1603-1868) was an interesting time period in Japan characterized by economic growth, isolationist policy, strict social order and rich arts and culture. The Fukagawa Museum re-creates a working class neighborhood in the Edo era. It isn’t a huge museum, but you can enter each of the buildings and every detail has been thoughtfully re-created. Best of all, you are welcome to pick up the various objects and try them out. Every 15 minutes represents a day and different sounds and light effects change as you move from day into night (rain, roosters, etc). Our kids were really engaged here and loved going into each of the different buildings and examining the different objects. This is that authentic learning that travel leads to that I speak about in why we travel with our kids. You only need an hour or so here, but it is an awesome educational and fun activity where our kids learned so much. There are friendly volunteer guides who are happy to explain some of the things you are seeing. Adult entry 400Y, kids 50Y. Nearby the Kiyosuma Gardens may not be the largest gardens in Tokyo, but they are the perfect size to explore. The beautiful pathways and manicured vegetation provides a great opportunity for the kids to run around. There are fish you can feed in the pond which will swim to shore as soon as they see a person approaching the shoreline. Entry is 150Y/adults, children free. Senso-ji was founded over 1000 years ago and is the oldest temple in Tokyo. It is located a few stops away in Asakusa and is definitely one of the best Tokyo attractions. We ended up visiting on a public holiday and it was incredibly busy, but had a fun buzz in the air. Approach the temple from Nakamise-dori which is a busy pedestrian shopping street lined with shops selling Edo-style crafts and Japanese treats. The red main hall and five-story pagoda are both beautiful buildings. You will see a large incense cauldron at the front of the main hall where worshipers rub the smoke into their bodies for good health. The busy shopping street of Nakamise-dori (we were there on a holiday so I don’t think it is normally this busy). It is worth spending an hour walking through the streets of Asakusa, which is known as the low city where old-Edo lives on. The buildings are picturesque, and there are lots of small restaurants and artisan shops. On our fourth day in Tokyo we visited Tsukiji Fish Market in the morning and Shinjuku in the afternoon. This is one of the must-visit Tokyo tourist attractions. The market was supposed to be moved out of town in 2016, but luckily that has been postponed until mid-2018. Tsukiji is the world’s biggest seafood market famous for the daily tuna auctions. Since we were traveling with kids, we quickly eliminated the idea of queuing in the middle of the night for the hard-to-get tuna auction tickets. We enjoyed a leisurely breakfast before heading to Tsukiji at 9:30am. Tourists cannot enter the inner market until 10am once business is wrapping up, so this was the perfect time to arrive. I think it is really important to remember that this is a working market and tourists get in the way. We tried really hard to stay out of the way and keep a respectful distance from the vendors who are trying to get their jobs done. Since it is a busy working market, there are forklifts and vehicles zipping around, puddles on the floor, and blood and fish parts galore. Keep a tight hand on the kids, wear close-toed shoes and try to not get in the way! Most workers ignore the hoardes of tourists, some look annoyed (one told me “no pictures”), but the odd one will be happy to show off their prizes. At 10am, you can start walking up and down the aisles of the inner market where the workers are cleaning up for the day. You definitely want to be there right at 10am, because by 10:30 things are really winding down. You will see huge pieces of tuna, buckets of seafood you can’t name, and lots of fascinating things. This is definitely one of the most interesting things to do with kids in Tokyo. We probably spent almost an hour looking around in the inner market before having a look at the outer market. I bought some beautiful Japanese ceramic ware for dirt cheap prices in one of the shops. A really popular thing to do is have a wonderful, fresh sushi meal at the market and there are long queues for most shops. The prices looked quite high and we really aren’t that adventurous when it comes to seafood, so didn’t do that. Look for this ceramic shop in the outer market. Super cheap, lovely Japanese ceramics. Shinjuku is sensory overload with its crowds, video screens, and skyscrapers. Shinjuku Station is the world’s busiest station with over 3 million people moving through it each day. It is massive and hard to orient yourself when you step outside. Traveling in Japan is expensive and we worked hard to keep our daily costs down. We were tempted to see the Tokyo skyline from the Skytree or Tokyo Tower, but just couldn’t justify the cost for a family of 5. Luckily, you can get a skyline view for free at the Metropolitan Government Buildings. It is a bit of a walk from Shinjuku Station, but definitely worth it. We waited less then 5 minutes for the elevator to take us up to the 202m high observatories. You can go up the north or south tower; both offer great views with signs showing what you are looking at on the horizon. Shinjuku features up-market department stores, racy nightlife, soaring skyscapers, swarming crowds, neon lights and so much more. We aren’t huge shoppers (our kids wouldn’t tolerate it anyway) but you could spend days shopping in Shinjuku. Tokyo-Hands is a really cool department store that is definitely worth checking out. We did walk the streets on the east side near Yasukuni-dori taking in the crowds, lights and action. We couldn’t pass up another opportunity for karaoke and we found a fantastic place on Shinjuku-dori to sing away. The boys got tired of singing, but that’s okay, because we ordered them some shaved ice and they were happy. If you are visiting Japan with kids, you have to do this! It was one of our favourite things to do in Tokyo for kids. Check out this luxury karaoke room they gave us! Our fifth and last day in Tokyo was a short day because we had a flight out that evening. We felt like we had seen a lot already and decided to treat the kids to some kid-friendly attractions at Odaiba. My guidebook didn’t mention Odaiba, but it is a shopping and entertainment district on a man-made island in Tokyo Bay. You take a monorail to get there, which is a fun experience in itself. There are a few stops on the island and different shopping/entertainment complexes. It is a really kid-friendly place and while it may be commercial, it is a great day out with kids. Jason has a great post on 21 things to do in Odaiba with kids which gave us lots of ideas. We let the kids pick a couple of things they wanted to do. They picked the Tokyo Trick Art Museum and Sony ExploraScience, but there are so many fantastic things to do there, many of them free. Sony ExploraScience is a science and educational facility put on by Sony. We spent 1.5-2 hours trying out the various interactive displays and activities. Our kids really liked the smile ranking activity and becoming an animated robot. Entry is 500Y/adults, 300Y/kids. We had never been to a 3-D or Trick Art Museum and since they are all the rage these days, we were eager to check it out. We got there right when they were opening at 9:30, which was great because it did get quite crowded later on. The kids had a blast posing, we took way too many photos and they learned quite a bit about illusions. The artwork is phenomenal and although we only spent an hour there, the kids had a great time. Entry is a bit pricier at 1,300Y/adult, 800Y/kids. At this point we had to head to the airport, but we would have loved to check out some of the other attractions at Odaiba. The Disaster Prevention Park sounded really interesting and our kids loved their last visit to a Kidzania where they get to test out different careers in a mini-city. The kids couldn’t walk away without spending their pocket money on trying to stand in a giant bubble on water. There are so many different neighborhoods in Tokyo and I was overwhelmed choosing where to stay. We ended up picking Roppongi, which is an upscale area, popular with expats. We really didn’t spend much time in Roppongi, so not sure I would stay there again. We were close to a metro station and in a nice residential area, but I found the restaurant options lacking. I think each neighborhood offers something different and next time we visit, I would likely try somewhere else. I would just make sure you are close to a metro station. Many people recommend being near the JR Yamanote loop. We weren’t and it was still easy enough to get around the city. If you have a JR Pass, it makes sense to stay near the JR Yamanote loop so you don’t have to pay for transit around the city. Mimaru Tokyo Akasaka – this condo hotel represents great value for families. Unusually large family rooms with 4 beds at a reasonable price. Located in a quiet residential neighborhood with easy access to Akasaka station. They also have a good location in Ueno North. Click here to check the latest prices. Hilton Tokyo Bay – if you are planning to visit Tokyo Disney, you can base yourself at this top notch hotel. The Happy Magic Suites are whimsical and a great option for families. Enjoy the luxurious grounds and great views of Tokyo Bay. Click here to check the latest prices. Park Hyatt Tokyo – this hotel was the setting for the movie “Lost in Translation” and it really is a gorgeous hotel in Shinjuku. They have twin queen bed rooms suitable for families up to 5, making it a great option for families looking for a luxury hotel in Tokyo. Click here to check the latest prices. Hotel Mystays Premier Hamamatsucho – the Mystays chain offers reasonable priced rooms. The hotel is in Minato and has a great location to access transit. The rooms are small but clean and comfortable with two full size bed configurations for families. Click here to check the latest prices. Hotel Sails – this brand new hotel offers 2-bedroom rooms for families at unusually low rates. This clean and modern hotel is 1.5 km from Senso-ji temple. Click here to check the latest prices. Check out this great article on where to stay in Tokyo, which breaks down the different neighborhoods. If you are looking at staying in an AIRBNB check out these great AIRBNBS in Tokyo. When we were in Kyoto, we stayed in a ryokan, a traditional Japanese inn. It was definitely a highlight of our trip as we got to experience sleeping on futons on the tatami floors, soaking in an onsen and eating kaiseki foods served in our room. Read about our experience here. It is more common to stay in ryokans in Kyoto and smaller towns outside of the city, but you can find some in Tokyo. Check ryokan prices in Tokyo here. The Tokyo metro map is an impressive colourful network of lines. It may look overly complicated, but it is a really efficient way to get around. We avoided traveling in the really busy rush hour time periods where the trains are jam-packed. Since we didn’t have a JR Pass, as soon as we arrived in Tokyo we picked up Pasmo cards for everyone. For the adults, it was easy to get at the ticket machines, but for the kids you have to visit a station office. This took about 15 minutes as we had to fill in some paperwork and show each kid’s passport. Having the Pasmo (or Suica) cards are great because you never have to worry about purchasing tickets for each ride. Just keep a balance on your card and tap and go. The trains work really efficiently. Riding the metro in Japan is all about being respectful of others: no food or drink and no talking loudly or playing music. I did find it a bit stressful trying to keep the kids quiet and well behaved on the trains. Telling stories on the metro – this is the GOOD. I didn’t take photos of the BAD! If you do have a JR Pass, check out these great day trips from Tokyo. You can read all about how we planned our trip to Japan. I still love my paper guidebooks and this time I opted for a pocket Lonely Planet. It was easy to carry but still gave us good background info on the neighborhoods and sites. 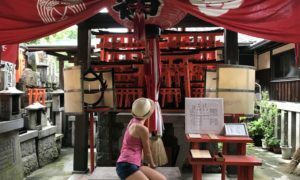 We hope this has given you lots of good ideas for what to do in Tokyo with kids and you enjoyed reading our Tokyo family trip blog. Have you been to Tokyo? What were your favourite things to do? Sooo happy to find this post in your blog. Your family seems very similar to ours. So, I’m getting lots of great ideas! Thanks!! Glad it is helpful Christine. Let me know if you have any questions that I can help with. We loved our time in Japan and can’t wait to get back! How old were your kids when you traveled to Japan? Would you have any qualms about taking a 10 month old on the Kyoto/Tokyo adventure? This blog is great- looks like a great itinerary for a young family and with some great insights- Thanks! Thanks Sara. 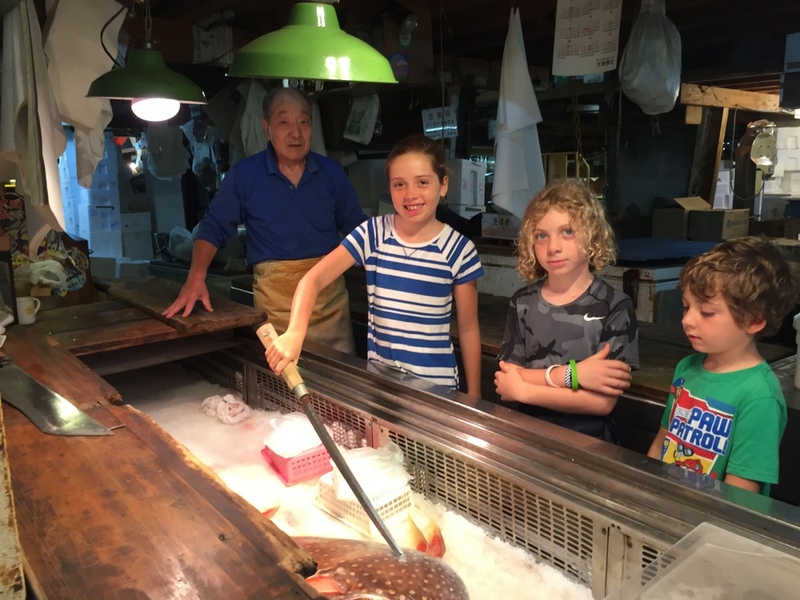 We loved our time in Japan – great destination for families.